A photo of the Perfect Panel is a great way to start off the week. 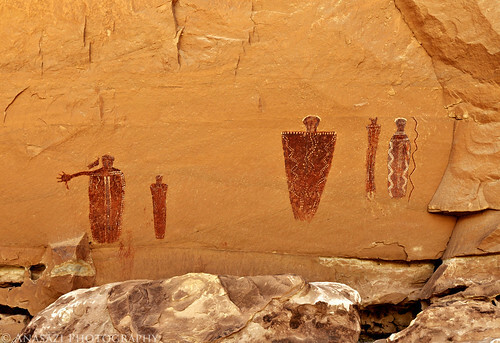 This astonishing pictograph panel is probably one of my very favorites that I have visited so far. Not only is this panel in impeccable condition (hence the name ‘Perfect Panel’), it’s also in a very impressive location that is just a little bit tricky to locate and to visit. This photo shows the full panel in all it’s glory including the well-known ‘hitchhiker’ anthropomorph on the very left.